The local library is sponsoring series called "Spirits and Shadows" this month. They're discussing good and evil as represented through ancient mythology on the big screen. You know I'm ALL OVER that! 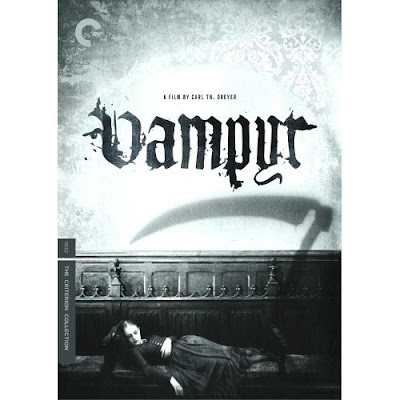 Tonight we watched Vampyr, a black and white surreal flick that was all about suspense without delivering any gore. Its fun watching a 1930s vamp flick with people who hold degrees in theology and come in expecting to be intellectually stimulated versus idly entertained. One lady insisted this series is too far fetched for her sensibilities and the director told her its supposed to stimulate her spiritually rather than intellectually. After all vampirism is just a physical embodiment of things we experience daily. Most of us don't have people leeching our blood but they can leech life force without ever touching us. Its just a fairy tale way of further understanding human relationships. I watched Daybreakers last week, which delivered gore and shock but didn't leave much to think about. Vampyr was the exact opposite. Awwwh, now why doesn't MY Library rock this series? I am all over that and I could totally wear one of my capes...scratch that, this is Arizona and hot, hot, hot! I would rock the whole black ensemble and wait to be enlightened. I was mildly put out with Daybreakers, I liked Legion better though it had nothing to do with Vamps. I love vampires and fairy tales and mythos in general! That would be so much fun - what a great series. I love horror movies. I have not seen Daybreakers yet, but I will have to check it out.